Tristaniopsis laurina, is commonly known as the ‘Water Gum’ or ‘ Kanooka Gum’. It is a widely used street. screening and shade trees. Often called “Water Gum” however it is not actually a eucalyptus. 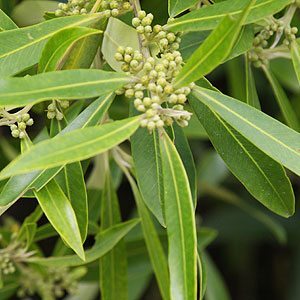 An evergreen shrub to small tree with good glossy foliage and attractive bark it can make a good screening tree or street tree. A hardy alternative to a number of exotic trees. It tolerates frost and is reasonably drought tolerant as well. Tristianopsis laurina are native along the east coast from Southern Queensland through to Gippsland in Victoria. In its natural habitat Tristianopsis laurina can grow to almost 18m, in cultivation as a street tree or specimen tree a height of 8-10m with a spread of 4m is more usual. A feature is the masses bright yellow flowers in summer. Although reasonably drought tolerant this is a species that does appreciate some water in extended dry periods. This is a plant that has earned itself a place in landscapers eyes as an ideal street tree or specimen tree. This is a tree that grows well in a range of soil conditions. It will grow in part shade however it is better where it gets a good amount of sun. Pruning is easy which makes it a favourite in street plantings. Luscious is a bushier form with larger foliage. Excellent screening plant. Variegata Green and yellow variegated foliage. 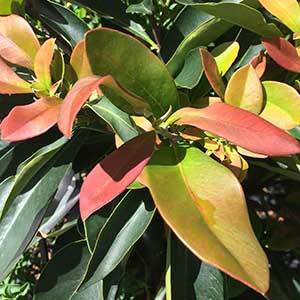 Burgundy Blush has very attractive new foliage, pictured. Water – Water well through first two summers. Regarded as drought tolerant in good soils once established. Landscaping Uses – Used as a street tree and as a shade tree. Also useful as a large screening tree. Pruning – Generally pruned to a single leader when young. Can also be pruned to shape if required. Propagation – From seed or from cuttings. Container growing – Generally not suited to containers over a time. Tristaniopsis laurina is available for sale from the following wholesale nurseries.